Everybody tells pregnant women what they can’t eat. Now, certified nutritionists and registered dietitians Stephanie Clarke and Willow Jarosh are here to tell them what they should! Featuring recipes for wholesome, unprocessed meals and snacks, accompanied by nutritional breakdowns and tips for the best ways to alleviate pesky pregnancy symptoms, Healthy, Happy Pregnancy Cookbook is the go-to guide for new moms throughout pregnancy and after. 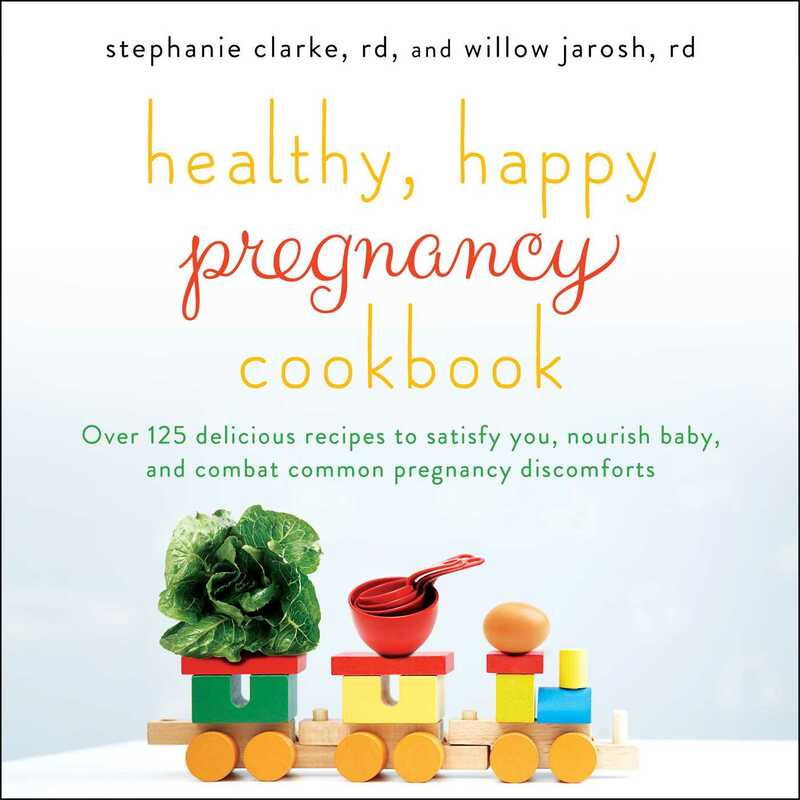 Healthy, Happy Pregnancy Cookbook is the perfect guide for pregnant women. Full of humor, heart, and wisdom, it promotes clean eating and the idea that using food as medicine is the best remedy for dealing with the symptoms that occur most during pregnancy—such as swollen ankles, bloating, and more. Leg cramps? Sit back with an Orange Carrot Cream Smoothie. Constipated? Try a Sweet & Salty Popcorn Trail Mix. Exhausted? Put your partner to work on a 3-Minute Salsa and Cheddar Microwave Egg Sandwich. There are also recipes for nausea, water retention, and heartburn, as well as nibbles sure to satisfy even the most bizarre cravings, prep ahead recipes for after the baby arrives and time is precious, and power meals made for moms who are breastfeeding. Healthy, Happy Pregnancy Cookbook will help new parents make smart and satisfying food choices whether dining in or out, before and after the kiddo arrives. The perfect gift for any new parent, it is sure to help make pregnancy healthier, happier, and even more delicious. Major congratulations are in order! You’ve just scored an amazing new gig as the CEO of a new start-up. This will likely be in addition to one or more existing jobs—let the multitasking begin! Your new assignment involves your body taking on the exciting forty-week challenge of growing the next generation of (insert your last name here). Whether it’s your first or fifth baby, this will without a doubt be an experience like no other. And while there will be many magical moments, like any job worth having, there will be aspects that will come in the form of some not-so-magical side effects. We’re talking about nausea, “cankles,” and constipation, to name a few. All the while you’ll be tasked with something very important—eating right to nourish you and your baby in the best way possible. On that note, we introduce you to the Healthy, Happy Pregnancy Cookbook, organized by common pregnancy symptoms. Like any other cookbook, these chapters are filled with recipes—delicious recipes. But unlike any other cookbook, these recipes all contain ingredients that deliver the nutrients your body needs to combat the most common pregnancy discomforts while nourishing baby in the healthiest way possible. It’s an “eat-to-beat” way of looking at your meals and snacks. As a crazy-powerful (or is that crazy, powerful?) CEO, these nutrients are your employees. And while the tone of this book doesn’t take itself too seriously, we take your needs very seriously. So you can laugh while you whip up truly healing meals. These recipes are free of overly processed ingredients and filled with whole foods. This means that when eating these meals you’ll be avoiding an excess of processed carbs, too much added sugar and sodium, and fewer icky additives, all of which can impact your (and your baby’s) health, as well as how you feel in the short and long term. Clean eating is a term that is thrown around all the time but has, until this cookbook, never been applied to pregnancy. And you don’t have to special-order obscure, ridiculously expensive ingredients to make these meals. We had you in mind when we created them and we respect your time and your bank account while also believing that you deserve the most delicious, nutritious, healing food. Think of these recipes as a reflection of you—they multitask, they get a whole lot accomplished, and they have great taste. Last but not least, these recipes can be used for years and years after your pregnancy, so we hope they become favorites for your entire family. Someday that little poppy seed-, or kiwi-, or cantaloupe-size human inside of you might just make you Mother’s Day breakfast from this book.